The Clever Container craze hasn’t yet hit my neighborhood, but I can see why it likely will. The home parties for cool organizing gear are not only a great excuse to get out with friends (and perhaps drink wine), Clever Container has great stuff. One lucky MommaSaid reader will win a Bottlebag Plus (retail value $41.95) and a ZipVac Starter Pack (retail value $28.95). Founded by two friends, Karen Eschebach, a professional organizer, and Jennifer Weaver, a stay-at-home mom, Clever Container has fabulous products to help you organize your life. Featured on Good Morning America, Clever Container isn’t your mother’s Tupperware party. The ZipVac Starter Pack allows you to seal in freshness for meat and other perishables. The starter pack comes with 1 manual hand pump, six Quarter-sized bags, 6 gallon bags, 2 two gallon bags and two utility bags. Post a message below this blog entry telling us what in your house needs containing, for your chance to win. One winner will be chosen at random by Random.org. Monday, March 22nd at noon ET. Random.org picked #0, so you are the winner! E-mail me your address at jensinger@mommasaid.net and I’ll send you the prize. Thanks everyone for your great comments. It seems we all need a little containing. Check back on Fridays for more awesome giveways here on MommaSaid. And don’t forget to enter your funny parenting story into the Housewife Awards, too. I have lots of things that need to be contained. Nail polishes and all the accessories that go with them need a place – my two daughters use those items alot! A place for hair items, barrettes, headbands would be nice…I could REALLY use a place to put some of the American Girl doll clothes and accessories too! Everything! The kitchen is the worst though. Thank you for the opportunity to win this great product. We totally need everything contained. LOL But right now, all of our computer stuff is spread across the family room, do to not having a computer desk at the moment. 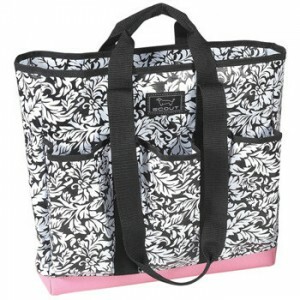 I’d love a nice tote or storage bags to work with. We need to contain toys and my pre-teen daughter’s magazine collection! The Tiger Beats are taking over!!!! The toys at our house need containing! Everything in my house needs containing! I need a good system for my mobile scrapbooking days. I need a way to help my 8 yo daughter to get her room organized and a way for her to learn to THROW THINGS AWAY! My computer room is a mess. I need all the help I can get. Thanks for sharing the Clever Container products. Have a Blessed Week. In a house with a 3 year old and a 2 month old what doesn’t need to be contained? Toys, diapers & bottles in the diaper bag, my sanity (it keeps getting away from me). Looking at the clever container website these ladies have lots of cool ideas. Thanks once again to Jen for introducing me to something new and fun! I need something to organize the paperwork that comes in this house on a daily basis from the kids papers from school, mail and then my home based business paperwork. Everywhere I turn there is another pile of paper….I’m drowning….HELP! What needs organizing around here? Are you kidding? The short answer is “everything”. More specifically, my car (which we’re in every day for about 2 hours). Also, school papers (what do people DO with these?). And pictures. I guess those would be my top 3. Aren’t you glad you asked? Paper, paper, & more paper!!! my entire office needs containing! beyond that, it’s always nice to have a nice bag to contain all of the stuff one volunteers to bring to a backyard get-together! We really could use some sort of device to organize mail! With 3 adults in the house, we get an awful lot of mail… and of course a container for junk mail recycling would be handy, in an effort to be a little green! The ZipVak looks pretty amazing, I know we could utilize it since we are constanly buying food, especially meat, in bulk. Really after containing my house (which needs it) the next most important thing to contain would be my husband. He folows me around the house and tells me how to do everything I have done to his satisfaction for 40 years. Please help. My craft supplies and all of the samples that I have obtained after 14 years of selling Signature HomeStyles! LOL!! Everything in my house needs organizing. Mostly toys, videos, and kid stuff!! Toys, toys and more toys – and all of the little pieces that go with them! I am currently on the search for decorative boxes and baskets to store our DVDs. My husband can’t part with them and I’m tired of looking at them. EVERYTHING! But in terms of the bag, all the water and snacks for soccer, yoga and other activities that go on around here. What in my house Doesn’t need to be contained. I think every item in our Kitchen is out of place. We had it all together once but that was 3 years ago before toddlers and pregnancy. I could really use some help with my containing and organization. Between having a 4 1/2 yr. old daughter with tiny hair clips, lip gloss containers and sticker sheets that blanket my living room and a husband with tools, work clothes and other miscellaneous items that always go missing, my house is in deperate need for some organization containment! What in my home needs containing? My kids, but they don’t make a bag sturdy, or big enough! Ha Ha! Seriously, I’ve been searching for bag that has great spaces for water bottles, snacks and a essestials for the impromptu trip to the beach or the corner store. Toiletries like shampoo, hairspray, etc. They multiply at an alarming rate. Guests come and leave bottles, I get samples that I ‘save’ for travel, buy stuff I end up not liking but can’t bring myself to throw out. It’s a disease.